After the publication of her best-selling book To Begin Again, Naomi Levy received a flood of feedback from readers telling her how much the prayers in it had helped and moved them. Many urged her to publish a collection of her prayers—and now she has. In a time when we all need inspiration, comfort, and connection, Talking to God will help us reclaim prayer as an integral part of our lives, making it as natural and uninhibited as talking to our loved ones. Prayer is essential to the lives of millions, but many of us are searching for ways to supplement traditional prayers with ones that are less formal and more intimate. Written in a simple and direct style, the prayers in this book—and the wonderful stories that accompany them—are for people of all faiths, and for all occasions large and small. Naomi Levy’s personal prayers address the anxieties and roadblocks we all face in contemporary life. There are prayers for facing a new day, realizing one’s potential at work, celebrating an anniversary or birthday, and going to sleep at night. And there are prayers for the more profound occurrences in life—love and marriage, pregnancy and childbirth, illness, loss, and death. Rabbi Levy’s words, imbued with grace and empathy, touch on the entire range of human experience. Many of us will recognize ourselves in her prayers and stories and will be comforted by them, as well as challenged and uplifted. Perhaps most important, they are stepping-stones for us to go on and create our own prayers, to find meaning in our own lives, and to begin or renew our own relationships with God. Naomi Levy, author of" To Begin Again, " was in the first class of women admitted to study for the rabbinate at the Jewish Theological Seminary of America and was the first female Conservative rabbi to lead a congregation on the West Coast. She lives in Venice, California, with her husband, Robert Eshman, and their children, Adin and Noa. "From the Hardcover edition." 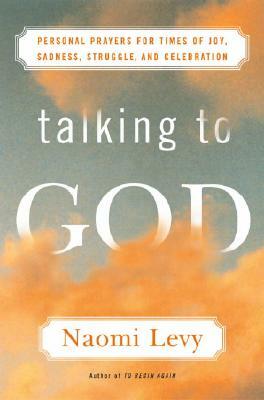 "Those of us who have been deeply moved by Naomi Levy's book, To Begin Again, will welcome her new book, Talking to God . The beautiful, simple, and direct prayers she offers here will enrich the spiritual practices of persons of all faith traditions." "Talking to God is a beautiful and heartfelt collection of prayers. It's filled with wisdom, compassion and plenty of insight. I loved every page and will refer to it often." "The author challenges us to partner with God by doing all we can to answer our own prayers... Talking to God involves a lecture to self, then a prayer beyond self to One who calls you out of self." "I hope that all the people who feel detached from God because they cannot pray will read Naomi Levy's book and learn to re-connect."